Now for the next installment in my Bissell Brothers journey. On a recent trip to Maine for the Swish release, I grabbed my allotment of their highly-coveted DIPA that is giving the rest of New England a run for its money in the IPA world. This part of the country is currently home to some of the highest-rated beers on the planet and Bissell Bros. will need to fire on all cylinders if it wants to be mentioned in the same breath as Tree House, Trillium, Hill Farmstead, Lawson's, and many, many more. Pours a murky, unfiltered light orange with no light getting through this thing at all. Almost no head to speak of as an aggressive pour generated less than a finger's worth. The aroma reminds me a lot of Trillium IPA's with touches of grass, but an overpowering presence of tropical juices and orange sherbet. Tangy orange juice up front on the taste which is quickly kicked to the curb in favor of bitter, grassy hops. Then boys and girls, it switches back to the fruit juices with peaches and mango. There's even a dry, wheaty taste to this which adds some lighter flavors to allow the beer to ease up on the explosion of tropical goodness. On the transition to the finish, dank, weed-like hops cover the back of the tongue and leave a sublime aftertaste. Mouthfeel is medium and exactly what you'd expect from the style. As a DIPA, it is refreshing with no indication that it is syrupy. Another plus is the absence of any alcohol sting, but it does come up a little flat as carbonation is hard to come by. 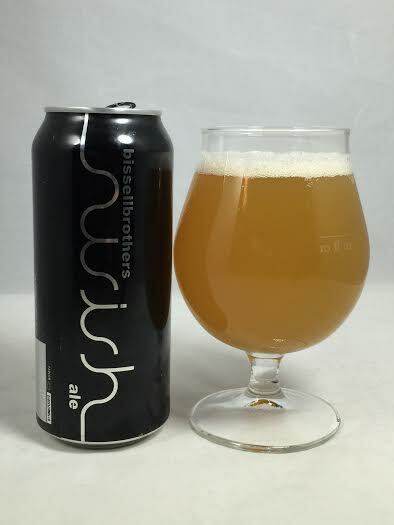 Swish is an excellent entry into the repertoire of New England IPA's and is another example of why Maine is starting to become a force in the craft beer world. It has the drinkability of a single IPA, but packs in an explosion of citrus and dankness which will have you comparing it to the best beers available in the Northeast. Speaking from experience, if you are willing to make the drive to Maine to get Swish, it is worth it as the wait is still relatively reasonable when compared to the likes of Tree House. You can show up an hour early and still see a small line gathered outside and Swish seems to last all day. As one of the most sought-after DIPA's in New England, it is still easy to obtain if you want to make the trip and not deal with an absurd crowd.